Katoro is a beach which is only 3 km from Umag, on the western coast of Istria. Katoro can be approached both from Umag and Novigrad. Particularly noteworthy is the pebble beach surrounded by conifers. As an urban beach, there are many entertainment options available all day. Whether you have come to Katoro to enjoy the sun and tranquility, to taste excellent food or to do some water sports , Katoro offers every beach visitor something out of the ordinary. Sol Polynesia in the resort of Katoro is a beach that is ideal for children with families. The beach consists mainly of sand, gravel and stones. Particularly noteworthy is that this beach elderly or disabled people gives easy access to the sea. All nudists beware! A part of Sol Polynesia beach is separated by a conifer strip for all naturists! In addition to sunbathing and swimming in the sea you will also find tennis and sports centers and a sports field in the sand! Lanterna is a beach on the Cape between Novigrad and Porec. Part of this beach is steep and rocky. The other part is a pebble beach where sunbeds and showers are offered. The pebble beach is ideal for families with children. Animal lovers beware: Part of the beach is for those vacationers who are traveling with their dog! Koversada, the beach in Vrsar is a paradise for all nudists! This beach is not only the largest nudist beach in Croatia, but in the whole of Europe. The nudist beach Koversada has been around since 1961. In the former Yugoslavia Koversada was the only nudist beach! This beach is mostly rocky, but offers several rock plateaus, which are ideal for sunbathing. Many small beeches with shallow beaches are perfect for children and families. On the opposite island, sun loungers, parasols and showers are offered. Animal lovers beware: A fenced part of the beach is designed for dog lovers! Enjoy the many cocktail bars and smaller restaurants right on the beach! Lone is a bay sheltered by the Zlatni rt Rovinj forest park. Lone has some beautiful pebble beaches that stretch throughout the bay. This beach is suitable for bathers of all ages, but especially for children. A nearby quarry is suitable for all adventurous visitors who want to try climbing. Lone is a bay where you can escape the hustle and bustle of the day and enjoy the peace and quiet. From this bay you have an excellent view of the old town Rovinj on the island Catherine. The beach of Mulini is located near the town of Rovinj. The special thing about this beach is that Rovinj is a new beach town . Once upon a time, this beach strip was an unattractive coast, but over the last few years it has been expanded more and more. Today, the beach of Mulini is a luxurious beach with many landscaped green areas. The beach has also been extended to ensure that even disabled people have easy access to the sea. On this popular peninsula you will find Hawaii in Europe! The Hawaiian pebble beach offers easy access to the sea, so you'll always findhere families with children . For all adrenaline junkies, there is a high cliff, from which you can jump into the sea. But the surfers are not too short on this beach thanks to the high waves. It is probably because of these waves that the beach on the peninsula Verudela in Pula is called Hawaiian. On the whole, young and old enjoy themselves here. Rt Kamenjak is a beach for those who love wild beaches . Here you can swim in crystal clear water and escape the crowds of other, popular beaches. The protected nature park Rt Kamenjak in the south of Istria, on the peninsula Premantura. The latter is known for its beautiful sandy beaches! Rt Kamenjak stretches over 30 km with many coves and sandy beaches. A unique experience for families with children. Bijeca Medulin is a beautiful coastline with many small islands and great beaches in front of it. The most famous among them is Bijeca, a sandy beach that stretches for over a kilometer and gives easy access to the sea . A paradise for children and the elderly. Above the beach is a tree-protected area where you can find shelter from the sun. So you can easily spend the whole day on the beach. Volleyball players will find here a great way to pursue their sport. 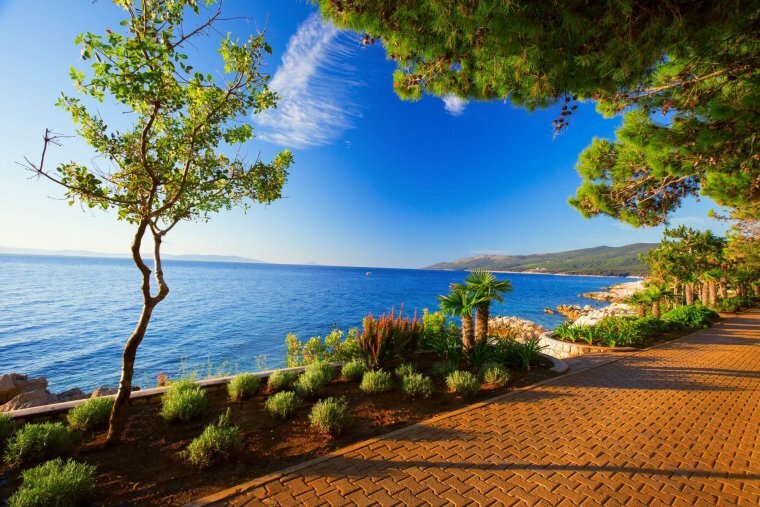 Girandella in Rabac is located on the east coast of Istria and offers its visitors a beautiful pebble beach. The beach is surrounded by a dense Mediterranean forest, which offers all visitors a natural shade. Part of the beach is specially designed for disabled people. Girandella offers many activities for children, adolescents as well as adults. Sun loungers and parasols can be hired. In the countless cafes and restaurants you can relax from the summer heat. Enjoy the summer festival every July! Who does not want a few insider tips where you do not go down in the crowd? Where exactly the top tennis courts in Umag, Rovinj, Porec, Pula and Rabac are, can be read here.